Click the cover for a better look. Digital versions ($1.99) are available at ComiXology and DriveThruComics. Also available through Gumroad. Print copies ($4.99) can be purchased here through Indy Planet. 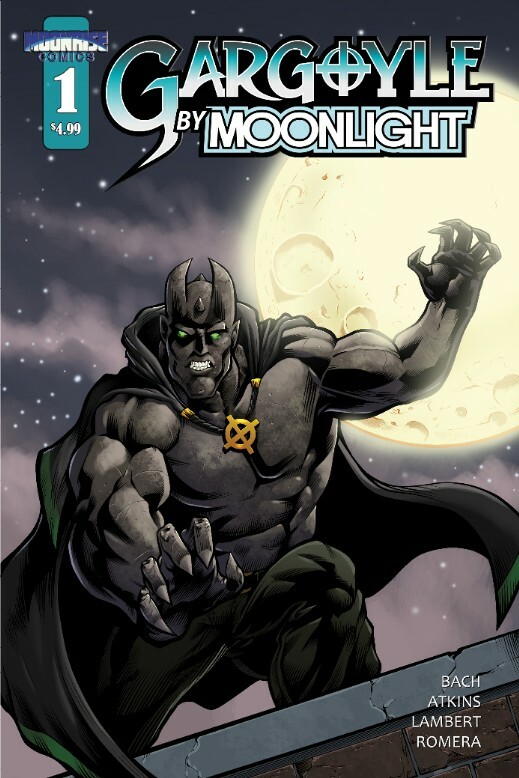 Gargoyle By Moonlight is a 36-page full-color monster-punching thrill ride of a mini graphic novel. An action-packed supernatural urban fantasy, this standalone comic is fun old school storytelling, with charming characters and stunning visuals. Timothy Bach, writer; Brian Atkins, pencils; Jeremiah Lambert, inks and letters; Juan Romera, colors. Full color, 36-page graphic novel (hard copies include link to bonus online story--only available to print customers; digital versions contain exclusive content not found in any other format).